Hola todos! We have a combined zone P-day today carving pumpkins, so I'll try to fit in as much as I can about another great week in the mission field! This week was a bit slow, and super-duper rainy! But we still had some great lessons. We saw our favorite Liberian family again, the Sandos. 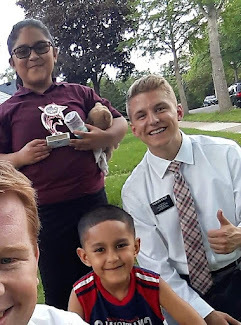 They said their transition back to America hasn't been the best, and it was great to visit them again and strengthen their testimonies of the gospel. It was funny because we asked them lots of questions about what it's like in Africa, and they were like, "We actually have this really spicy African chicken, here try some!" and it was soooo good! Hispanics trained me well lol, I LOVE spicy food now!👌🏼Elder Nielson on the other hand was suffering 😂 hahaha! He couldn't handle the heat. Anyway, I love that fam and Derek is such a stud, he sat by us at church on Sunday and really enjoyed it. Oh, and we set a date for him to be baptized on the 11th of November, whoo!! We were able to do some awesome service this week, which is always a perfect stress-reliever. We helped our investigator Kevin build a fence on his ranch which was pretty gnarly! It's pretty amusing, too, because while we worked out in the drizzling rain, all of his sheep would just follow us around like our own little paparazzi😂 Then we also helped out some members out in Northfield on Saturday morning. It was actually the crazy guy in the ward who bit my name tag! lol. He's super nice, but just a little crazy. We helped him take down this giant oak tree in his front yard. Made the biggest crash ever, it was epic! Then we spent most of the time cleaning up the branches and what not. Good fun! Another highlight from the week was that our little buddy Landon got baptized! The service was amazing and the spirit was so strong. His older brother was able to baptize him and they were smiling and had their arms around each other the whole time. Such a sweet brotherly bond! Landon was beaming the whole time, and he was so excited that afterwards we went over to their house so he could give us these sick shades😎 I'm so glad we got be a part of it and help their family who is going through some rough family struggles. But it was so nice to see the family strengthened by the gospel of Christ😊 I know that the gospel blesses families, and through our redeemer Jesus Christ we can have true and lasting joy for eternity! Well we are about to head out, but I love you all and hope you have a wonderful week! One Year Mark Celebration S'mores Cake!